While our dogs and cats too have powerful “scentsabilities” and can locate us in crowds of people, how well can we recognize our furpals by their smell? Research conducted at Queens University in Ireland with 26 dog owner participating showed surprising results. In one of the tests, using blankets given to them, the owners were instructed to let their dogs sleep on them for 3 nights, but in a different room than theirs. Then, blindfolded so they couldn’t recognize their own dog’s hair, each owner was given 2 blankets to smell, their own dog’s blanket and an unfamiliar one although the same or similar breed. Asked several questions, including which blanket belonged to their dog, 88.5% of the owners were able to identify their own dog’s blanket by scent alone. While our sense of smell doesn’t come close to our dog’s “scentsitivity”, most of us seem to able to recognize our dog’s scent. On a personal note, each of my dogs have their own individual scent and are easily detectable by me. Of course, to our dogs, our smell elicits feelings of love, comfort, security and joy to them. 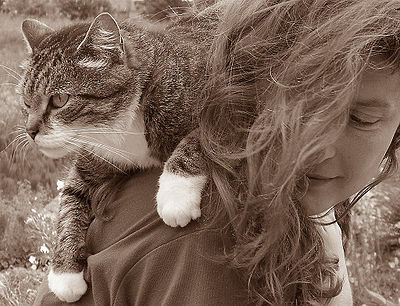 Interestingly, of 25 cat owners who participated in the same study, only 52% recognized their own cat’s scent.